CAUTION: Be sure your gun is not loaded and the gun safety is in the lock position before installing scope mount. Remember to practice safe handling procedures at all times. Click the images below to view and print instructions. 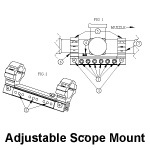 Slide the BKL scope mount over dovetail of firearm or adapter plate. Secure mount by tightening the clamp screws. 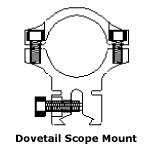 Note: If you have a drop-compensated mount, the dot(s) on the bottom of the mount indicate the muzzle end (toward the target). If mount slot is not wide enough to fit over dovetail of the gun, widen the slot by removing the clamp screws and placing them into the spreader holes. Hand tighten the screws until they touch the inside wall. Then, with the hex wrench, turn the screws in increments of 1/4 turns until the slot widens to slide over the gun dovetail. Remove screws and place them back into the clamping position. 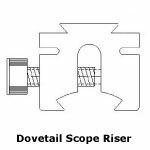 Slide the BKL scope riser over dovetail of firearm or adapter plate. Secure mount by tightening the clamp screws. Slide the BKL scope mount adapter over dovetail of firearm or adapter plate. Secure mount by tightening the clamp screws. If mount slot is not wide enough to fit over dovetail of the gun, widen the slot by removing the clamp screws and placing them into the spreader holes. Hand tighten the screws until they touch the inside wall. 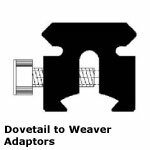 Then, with the hex wrench, turn the screws in increments of 1/4 turns until the slot widens to slide over the gun dovetail Remove screws and place them back into the clamping position. If the mount will not fit over the dovetail, widen the mount by removing all Clamp Screws (1) and place 3 of them into the spreader holes and tighten evenly until mount slides over the dovetail. When mount is positioned on dovetail, return all screws to the clamping Holes and tighten. Remove the Ring Caps(5) and position the scope in ring Saddles(6,7) and replace the Ring Caps. Loosen the Hinge Pin Base Screws (3) enough that the rings can pivot with light friction.